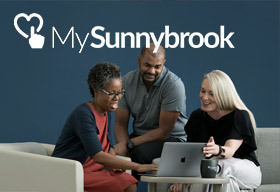 We welcome feedback about your Sunnybrook experience such as compliments, concerns and questions. This could be related to medical care or the general experience at the hospital. You may have heard the term Patient Relations, Patient Advocacy and/or Patient Ombudsman. Sunnybrook’s Office of the Patient Experience serves the role of these functions. We welcome you to share your positive experiences about you or a family member's time here at Sunnybrook. We know being in hospital can be difficult and so a compliment or kind word is meaningful for staff to hear. You, your family, your significant other or your substitute decision-maker have the right to tell us when you believe there is an opportunity for improvement. If the staff have been unable to help address and/or resolve your concerns, you are welcome to contact the Office of the Patient Experience. If you contact us with a complaint, please be assured the healthcare or service you are receiving will not be negatively affected in any way. What information do I need to share when submitting my complaint or compliment? The nature of your complaint/compliment – What happened? The name(s) of the person(s) involved and their role – Who is involved? Full names are helpful. When and where the issue happened – Specifics and details lead to a more effective outcome. If you are not the patient, confirmation the patient is aware of concerns brought forward, or confirmation you are the substitute decision maker. This is in keeping with provincial legislation which protects personal health information. How and where would you like to be contacted? Generally, what can I expect when I bring forward a complaint? Patient, family, and visitor complaints can be made in person or by phone, letter, email or fax. Patient consent is required prior to reviewing a complaint. A Patient Experience Advisor will collaborate with the health care team or department(s) and review relevant hospital documents. The complaint is reviewed with supervisor/manager/physician to facilitate. The patient/family/SDM is contacted in response to the complaint. Sunnybrook is not responsible for patient and visitor belongings. Please do not bring valuables into the hospital (this includes, but is not limited to, assistive devices (glasses, dentures, hearing aids, etc. ), cash, jewelry, keys, and watches). We understand a hospital visit is often unplanned. Be sure to pass your valuables to a friend or family member for safekeeping while you are in the hospital. If you are being admitted to the hospital, these valuables may include, but are not limited to, your walker, wheelchair, dentures, hearing aids, glasses, clothing, shoes, as well as cash, jewelry, keys and watches. How do I claim my items that were held by staff for safekeeping? I have a question about Parking. How do I get a paper copy of my health record? How can I access my health record online? I would like to arrange for an interpreter for an appointment; how do I do this? I'd like more information about repatriation. Please explain private vs. semi-private vs. ward hospital room accommodations. Can I buy flowers for a patient? Our offices are open between 9:00 a.m. and 4:30 p.m., Monday to Friday. If you are calling outside of these hours, please leave a message with your name and contact information. Your call will be returned on our next business day. Our offices are open between 8:00 a.m. and 4:00 p.m., Monday to Friday. 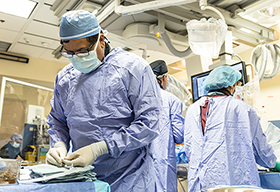 Sunnybrook Health Sciences Centre (Sunnybrook) is committed to ensuring a consistent and transparent process is followed when reviewing complaints and concerns from patients/residents, families and visitors. 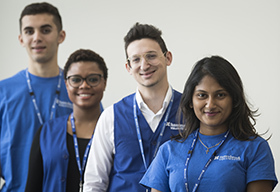 Addressing complaints and concerns will be done in keeping with the organization's core values of excellence, collaboration, accountability, respect, and engagement. Complaint/Concern: refers to dissatisfaction and/or a worry or anxiety with the care or service received. Compliments: positive feedback about a patient's experience in relation to a specific staff member and/or health care team where the patient/visitor would like the staff member and/or team to be recognized. Intervention: refers to situations that require quick attention and may relate to a concern, complaint or request for assistance. (In the Veterans Centre, this role is fulfilled through the Manager, Office of the Resident & Family Experience and Safety). Patient/Resident: this includes the patient's and/or resident's Substitute Decision Maker. At Sunnybrook, those residing in the Veterans Centre are referred to as residents. Point of Service: the unit, clinic, department or physician's office where a complaint/concern/compliment originates. Resolution: a complaint is considered resolved when all efforts to seek resolution with a patient and/or family have been exhausted. This is independent of the patient/family’s satisfaction level. Retrospective Review: complaints that require a review about previous care or service. OPE will review concerns within 24 months of the incident date. Substitute Decision Maker (SDM): An individual selected or appointed, in accordance with the Health Care Consent Act, for the purpose of making healthcare decisions, including consent to treatment and admission to a care facility on an incapable patient's behalf. 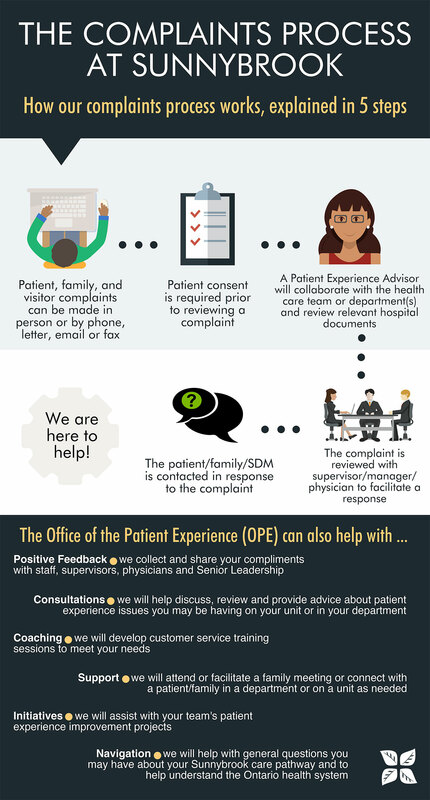 In order to protect patient privacy, OPE requires the consent (note: verbal consent is acceptable) of the patient before assistance can be provided. Sunnybrook maintains zero tolerance for any retaliation against those who bring a complaint forward. If examples of retaliation are brought forward, OPE will work with members of the Senior Leadership Team, Senior Medical Leaders and Human Resources to address these issues. Step 1: When an issue arises, please share these concerns as soon as possible with a member of your health care team. All staff, physicians and volunteers are here to help resolve your concerns and answer questions. Step 2: If your concern remains unresolved, please ask to speak to a Manager or Supervisor. 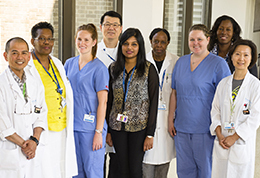 At Sunnybrook, on a Patient Care Unit, there is a Charge Nurse/Team Leader and a Patient Care Manager. In outpatient clinics, ask to speak to the supervisor or manager. Step 3: If your concerns still remain unresolved, OPE can be contacted to assist. Assistance can include: mediation, if the patient specifically requests our presence or presence in a family meeting. Step 1: Bring the concern to the attention of the appropriate supervisor, manager or physician. Step 2: Acknowledge the concern in a timely manner. This can be done by email, telephone, letter or in-person. *This process is a guideline, and can be adapted to meet the individual needs of the situation. Complaints received by the Office of the Patient Experience (In the Veterans Centre – Office of the Resident & Family Experience and Safety) will be reviewed by a Patient Experience Advisor. The Office of the Patient Experience will acknowledge receipt of a complaint within three business days. Time frames for resolving the complaint will vary depending on the immediacy of the issues, complexity, and number of people involved, for example. If a complaint is provided anonymously, feedback to the complainant will not be possible. There are situations that may require OPE to escalate a complaint to Senior Leadership. All feedback received in the Office of the Patient Experience is collected in a database. This is to ensure documentation and transparency of patient, family and visitor feedback. Patient Experience Advisors will facilitate coaching sessions to improve customer service skills, provide consultation and guidance and will assist in committee and project work. Assistance from the OPE is available Monday to Friday during business hours. After hours, complaints/concerns that require immediate attention may be forwarded to the Shift manager on duty through Communications. Complaints/concerns that do not require immediate attention may be left on the voice mail and/or written complaints emailed/mailed/dropped off to the applicable PEA.